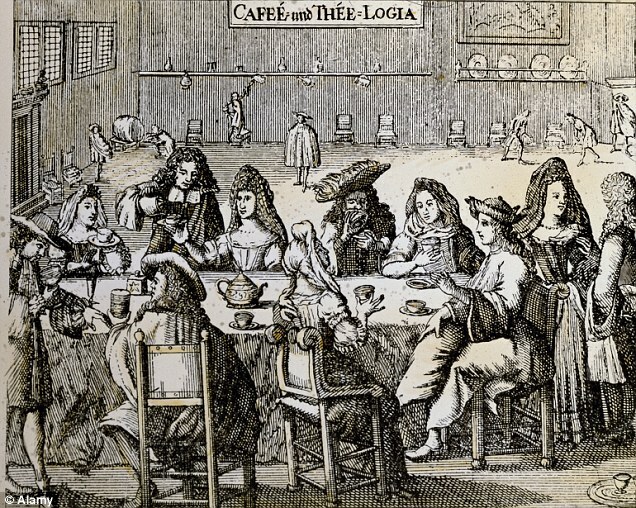 Allow me to blog a little about the first recorded coffeehouse in Chelmsford, a place I discovered while researching the history of the city’s early pubs. Excellently, it also recalls one of the first recorded bookbinders in Chelmsford. Back in the few years after the civil war, while Cromwell was busy banning whatever he really felt like, he banned inns and alehouses across Britain. This lead to other drinks becoming popular and thus ale was replaced with coffee, tea, and other popular non-alcoholic drinks, and began the rise of the coffee house – an English staple that still can still be found in most high streets today. One of these very early places was Mrs Hart’s, which has one mention on the title page of ‘A Catalogue of the Library of Books, Latin and English, of the Reverend and Learned Mr. Charles Adams’, printed in 1683. From what is merely a name of somewhere a seventeenth century bibliophile could find a copy of that catalogue, I hope to extrapolate somewhat the history of the coffeehouse run by Mrs Hart. The tale seems to start with Anthony Hart who was born in 1627, a ‘stationer’. He was most probably a bookbinder who also did numerous minor related things and either would have sold books or acted as a middleman; finishing products between a printer and a bookseller. He was an important member of Chelmsford’s community during the civil war and seems to have had some part in keeping the peace in those tumultuous times. Some time – most probably during that war – he had a son, Thomas, who would follow in his father’s footsteps as a bookbinder and stationer. Although there’s no record of his birth, he first appears in records in 1659 when, possibly even before he had reached adulthood, he was a witness in a case of witchcraft. He swore that he had witnessed proof that one Anne Woollward had bewitched one John Adams and been the reason that ‘his body was greatly wasted’. The case was thrown out since the jury saw no proof that any laws had been broken, but Thomas seems to have been a notable and involved enough member of the community that he appeared as a witness for numerous trials for the next twenty years. It seems that he took a very active role in policing the market and catching out cheats and people extorting money from poor quality goods. It was on the 27th October 1667 that Mrs Hart enters the story; on that day the pair married, most probably at Saint Mary’s in Chelmsford, and it can’t have been long after this that they set up Mrs Hart’s Coffee House. By 1669 Thomas had been made one of the ‘aleconners for the towne of chelmsford’ and had the truly fortunate role of testing the quality of the town’s ale. Certainly by the 13th January 1670 the two were involved in the coffee trade. Coffee houses were the centre of the literary and social elite, famous for meetings of poets and playwrights, and therefore many became bookshops as well as places for refreshment. This seems to be the case at Mrs Hart’s, since by 1670 Thomas was describing himself as a bookseller, as well as regularly shipping coffee, tea, and chocolate into the town. The Harts continued happily on, although almost came into trouble from the Secretary of State himself in 1680 when supposedly a letter received by then contained a terrible libel. Somehow, nothing seems to have come of this and perhaps the wary Harts destroyed the letter before it could be found and read by the authorities. This is the last that we hear of the Harts and their coffee house. Mrs Hart is never named, although a Mary Hart died in Chelmsford in May 1694 – and in my opinion this is the most likely candidate for Chelmsford’s coffee pioneer. Thomas lived on, and died almost exactly a decade later in May 1704. I must confess the exact location of their shop is a mystery to me, it was possibly connected with an inn owned by Edward Neale – which would make sense since the first coffee houses were inns closed by Cromwell. It would also explain why Thomas was for a while an aleconner, if at that time he was connected with one of the inns of the town. For now, though (and until I get a moment to research a few words more) allow this to be an end to my history of Chelmsford’s earliest recorded coffeehouse. As a continuation of minor histories of the old inns and alehouses of Chelmsford, allow me to blog a little upon an obscure old building that existed as a pub for the citizens of Chelmsford until 1807 – The Red Lyon*. This history is a little more obscure than my previous post on the Black Boy Inn since I can’t find any other piece of research that documents this particular pub’s history. Therefore allow the accuracy of this post compensate for its sparseness, for almost every thing written here comes from first hand records. 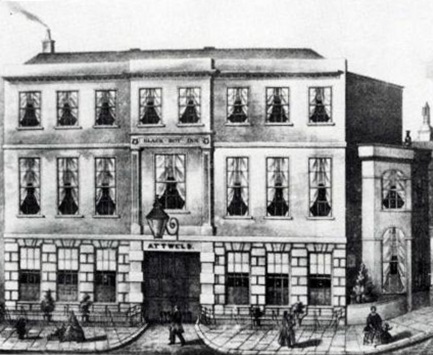 The Red Lyon stood opposite the Black Boy Inn, roughly on the site where Marks and Spencer stands now. This part of Chelmsford was first built upon in about 1205, when it’s possible that a man called Ormund had a hall of some kind there. By the end of the medieval period two inns stood against each other on the site – the White Hart (recorded as early as 1419), and the Lyon (appears in records in about 1455). The Lyon was sold to one Richard Chelmesford in 1455 and later passed to William Scott, who sold it in 1538 to a relative of his, Jeffrey Scott. Some time in the next 20 years Jeffrey also obtained the White Hart next door, since the two inns were rented out together to a succession of different owners during the 1560s. The inn was still called the Lyon in 1593, when one poor Abdias Maye was brought before a justice of the peace there to answer for his crimes. By this point the building was one of many properties acquired by the noble Petre family, and it was most probably them who renamed it as the Red Lyon in around about 1600 (although some records still use its old name of The Lyon for a long time afterwards. It next appears as ‘the Redd Lyon at Chelmsford’ in a letter dated 25 April 1620, when the Earl of Warwick met there to discuss with various Justices of the Peace over raising money to pay for a gift for the King of Bohemia. If a more rare subject for a meeting ever occurred in Chelmsford I would be surprised. 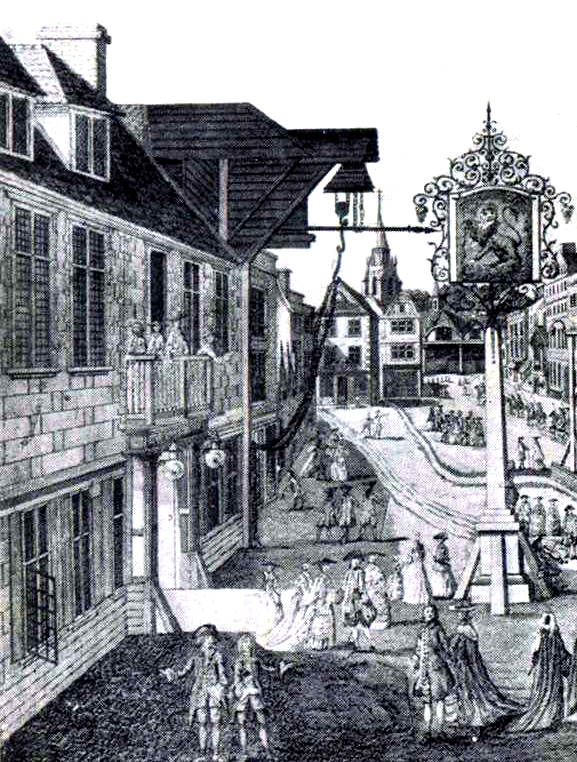 In 1711 it was used as a meeting place of the annual dinner for the Justices of the Peace of Essex – both the Red Lyon and the Black Boy Inn opposite were involved. Perhaps the food prepared by the cooks at the Black Boy were not quite up to the Red Lyon’s, since the next year it was the Red Lyon alone that was involved in the dinner. One thing that seems to have been a regular occurrence, either at the inn or just outside of it in the street, was the auctioning off of the turnpikes or toll roads in Essex. The winner of this remarkable sale would have the right to charge rents at those places for people using the roads until the next auction. 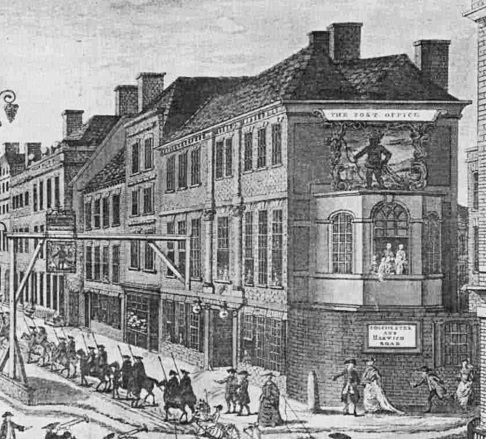 The Red Lyon continued some success as an alehouse, hosting annual dinners for several small Chelmsford societies until the end of the 1700s. Sadly, though, by 1807 the fine old building was recorded as being used as private dwellings, having closed down and been divided into four properties. There is no evidence of a sale, and not a word of who the last owners of it were, but I hope I have somehow revived the history of an old local pub that hasn’t served a drink now for over two hundred years. This was not the last time that a drink was enjoyed on this site, though, since the Queens Head seems to have stood there for a short while at the end of the 1800s. *One thing of some interesting note that I’ve found so far researching pubs is that, unlike researching most other buildings or landmarks, the spelling of a pub’s name varies very little when spelling of all other words can be quite different. I can only put this down to a pub’s name being written up over the door, so anyone writing about it would copy down what the sign said, leading to a pub’s name being spelled constantly the same way for centuries. But what was the Black Boy Inn? Well, kind reader, in the first of what I hope to make a sensible muddle of pieces on lost Chelmsford pubs, allow me to tell the tale of this forgotten alehouse. The roots of the Black Boy Inn go back far beyond the ‘three centuries’ vaguely mentioned by the council’s blue plaque, in fact, the inn seems to have roots in a very ancient Chelmsford indeed. It seems to have most probably started out in the middle ages as a hostelry owned by the De Vere family, the Earls of Oxford, who for some time had a seat nearby at Danbury and were one of the wealthiest noble families in south-east England. That at least part of their medieval construction survived until the building was pulled down in the nineteenth century is proved by the many architectural details recorded that still bore the crests and icons of the De Vere family, most notably carvings of wild boars, a key heraldic symbol of theirs. Legend has it that, one day, while entertaining Richard III near Chelmsford the king went missing from among the De Vere’s party. Panicked, and worried for the fate of that misunderstood monarch, they sent parties out to look for him and it was only after hours of searching that he was found enjoying a drink among his countrymen at the hostelry that would one day become the Black Boy Inn. The supposed room he drank in was still retained in the building for almost another four hundred years. The building finally left the ownership of the De Veres at about the end of the 1500s, and about this time underwent a makeover to change the medieval hall into a working inn. John Adey Repton wrote in 1840 about how Tudor elements had been inserted into the medieval structure, creating rooms and preparing it for a new purpose. For a little while it was known as The Crown or the Kings Arms, but by 1636 had been renamed one last time as The Black Boy. The earliest reference to a landlord that I can find is John Little who may have owned it as early as the very start of the 1620s. It then came to John Burles, who died in about 1629, passing the inn to one James Blanks, after which it passed to Anne Blanke, most likely James’ wife or daughter who inherited it after his death. This had all passed by 1642 when Henry Barnard, a Londoner, came to own the ‘inn known by the sign of the Crown, or the New Inn, or the King’s Arms and now the Black Boy’. He was not long followed as innkeeper by ‘John Harvy, Innholder att the Black Boy in Chelmsford’, who seems to have been serving drinks there before 1659, working alongside a Mistress Maywell. These early owners of the pub brought the success and renown that would allow its name to became famous over the centuries to come. It became a place where soldiers could come and sign up in times of war, a place where important lands and property were auctioned off, as well as a meeting house for all manor of people who passed through the growing town. The pub was mentioned in a publication in London in 1683, when the extensive library of one Charles Adams, late vicar of Great Baddow, was auctioned at the inn. To be chosen as the location for an auction of such merit to be publicised in pamphlets in London proves that the inn must have been a very important part of Chelmsford at this time indeed. Following the sad fall of the last Stuarts and the start of the Hanoverian monarchs in the early 18th century, the inn even acted as a temporary jailhouse for several people in Essex who had turned against the foreign king. They were made up of a good number of important landowners who were ‘taken up and committed under a strong guard to the Black Boy Inn at Chelmsford upon suspicion of being disaffected to K[ing] George’. They were, however, all later discharged and allowed free. By the middle of the 1700s the inn was a key location to where Chelmsford’s mail was delivered, and regular mail carts left from outside of it, by this time it had again had quite a make-over. Whatever Tudor frontage had stood before was replaced with a fine brick built front and Georgian sash windows, a grand columned porch over the front door; a modern look to suite the rapidly expanding town. The inn at this point had several grand parts to it, most interestingly an arched wine cellar that must have been earlier than any 18th century additions. From 1777 the Chelmsford Tradesmen’s Club met at the inn, and by the end of the 18th century there were two rooms being rented out as shops by a courtyard behind the property, which seems to have been accessed through a coaching-arch. In 1817 the pub became the meeting house of hopeful Tories who there began the Pitt Club, and indeed political meetings continued with the South Essex Conservative Association present there in the 1830s. By this point it had been the resting point of men such as George IV, the Duke of Wellington, and even Charles Dickens stayed a little while, who briefly names it in the Pickwick Papers. By the 1840s Chelmsford was quickly changing again, and in 1842 a station was built to connect the town more readily with the rest of Britain, in the same year the Black Boy was sold. A post office had by now been built next door, and it was no longer so fashionable for important societies to meet in local pubs. The inn continued under new ownership for the next fifteen years, but now with a station on the other side of the town and new visitors staying in more modern hotels near there, the Black Boy stopped being the successful inn that it had been for the previous three hundred years. In 1857 it was sold again, this time with a less happy end, and the building was dismantled. Some parts were saved, and odd parts of it are documented as being found in other inns around Chelmsford by different visitors over the following decade or more. It wasn’t long before the old inn itself was forgotten, only a small plaque being put up on the site where it stood – almost a century and a half later.